Homeowners who install privacy fences do so not only to prevent outsiders from looking in, but also to keep them from being able to trespass on the property. Anti-climb products give the added protection of making fences more difficult to climb, and helps to keep unwanted intruders from gaining access to a homeowner’s personal property. Anti-climb paint is petroleum based paint. It is the consistency of gel and does not set up leaving intruders with an unpleasant experience if they decide to try and climb a post or fence that has been coated with it. It is extremely slippery and prevents the intruder from gaining a sufficient hold that is strong enough to allow them to climb or make their way over the fence. Spinners are non-aggressive forms of protection that prevent an intruder to get a solid grip on the fence that would enable them to climb over. When the intruder, grabs on to the post or support, the spinning mechanism will cause it to turn preventing them to support their weight and pull themselves over. Spinners that are covered with spikes or other sharp tines are much more aggressive and will stop even the most adamant of intruders. Both fence spikes and spiked collars for poles and supports are effective ways of preventing unwanted intruders from climbing your fences. Spikes line the top of the fence and act as a deterrent for individuals who try to make their way across the sharp surfaces. Spiked collars and surface spikes are used to prevent intruders from gaining a hold on the fence that would enable to support themselves and pull their weight up and over the fence. 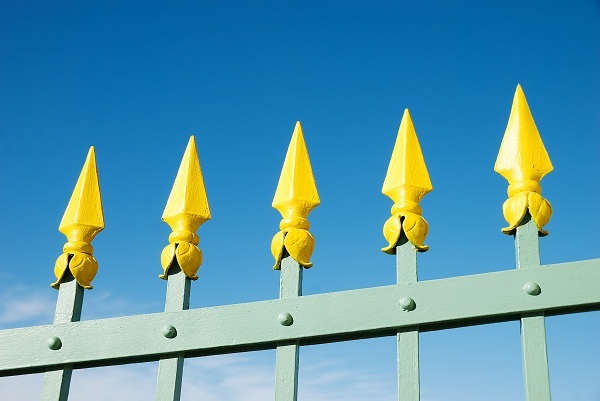 Spikes can be extremely sharp and are probably the most aggressive way to protect your property from being breached. Elizabeth is the Owner of California Fence Company, a leading vinyl fence provider in Orange County. She is committed to providing the best customer service and high quality installations of vinyl fences for her clients. The company also offers a wide variety of fencing options, including metal fences and hard scape services. This entry was posted in Fencing Guide and tagged Anti climb fence, home security systems. Bookmark the permalink.